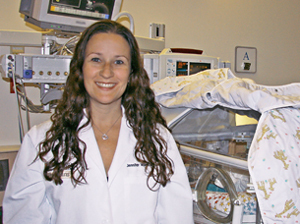 Washington University pediatrician Jennifer A. Wambach and her colleagues have identified a gene associated with respiratory distress syndrome in babies. The study is the first to identify a single gene — ABCA3 — that is associated with a significant number of cases of respiratory distress syndrome (RDS) in babies born at or near full term. RDS is the most common respiratory problem in newborns and the most common lung-related cause of death and disease among U.S. infants less than a year old. Their findings will be published in the December 2012 issue of Pediatrics and are available online. The research may lead to new diagnostic and therapeutic strategies for prevention and treatment to improve respiratory outcomes for babies. RDS occurs when an infant’s lungs don’t produce enough surfactant, a liquid that coats the inside of the lungs and helps keep them open so the baby can breathe. If there isn’t enough surfactant, an infant has to work hard to breathe and may suffer from a lack of oxygen. Premature infants are at especially high risk of RDS, as surfactant production increases as babies near term. However, 2 percent to 3 percent of term and near-term babies also develop RDS. The researchers’ findings suggest a range of possibilities, Wambach said. These include using the genetic knowledge to plan affected infants’ births near hospitals with neonatal intensive-care units and developing medical therapies to target the abnormal protein resulting from these mutations. Wambach said the researchers hope to identify additional genes that cause neonatal RDS and better identify babies at risk. The research team — including Aaron Hamvas, MD, and F. Sessions Cole, MD — evaluated five genes known to be important for normal breathing immediately after birth. Hamvas is the James Keating Professor of Pediatrics and medical director of the newborn intensive care unit at St. Louis Children’s Hospital. Cole is the Park J. White, MD, Professor of Pediatrics. The team looked at five genes involved in the metabolism of lung surfactant by taking DNA samples from more than 500 infants of African and European descent, with and without respiratory distress, who were carried to term or near term. They evaluated the same genes in an additional 48 babies with especially severe respiratory distress to see if their findings applied to that group, and in a third group of 1,066 Missouri babies, to determine the frequency of the mutations in a general population. In comparing babies with and without respiratory distress, they found that babies of European descent with respiratory distress were more likely to have a single mutation in ABCA3, one of the five genes tested, than the infants with no breathing problems. Babies of African descent with respiratory distress also were more likely to have single ABCA3 mutations, but this difference did not reach statistical significance. More than one-quarter of the babies with especially severe respiratory distress had a single mutation in ABCA3. Infants who inherit two defective copies of the ABCA3 gene usually require lung transplantation for survival. However, this is the first study to show that a single mutation in ABCA3 predisposes infants to respiratory distress that can usually be treated with neonatal intensive care. The researchers also found that 1.5 percent to 3.6 percent of babies born in Missouri carry a single ABCA3 mutation, leading the researchers to estimate that about 10 percent of RDS cases among term and near-term infants may be attributable to mutations in ABCA3. Funding for this research was received from the National Institutes of Health (NIH). Support also comes from the Eudowood Foundation, the Children’s Discovery Institute, the Saigh Foundation, and Kailos Genetics. NIH grant numbers are R01 HL065174, R01 HL082747, K12 HL089968, K08 HL105891, R01 HL054703, K08 CA140720-01A1.